Approximately 15,000 people attended the 2014 Institute for Electrical and Electronics Engineering (IEEE) conference. There were about 70 student entries in the poster competition. • Brad Tuffley and Douglas Rapier, who won the undergraduate student poster competition with their design for an open source phasor measurement unit. PMUs measure electrical signals on the grid and are synchronized to a GPS time source. Similar to the ways digital cameras have improved to provide higher resolution and highly pixelated pictures, PMUs provide an increasingly higher resolution picture of what’s occurring for power operators. By developing an open source PMU design, Tuffley and Rapier are facilitating widespread collaborative research and idea sharing so developers can improve grid monitoring. The project was supported by a U.S. Department of Energy grant. The grant, one of only seven awarded in the nation, aims to develop a collaborative educational program on applications of synchrophasors for the smart electric power grid and to better prepare the future power industry workforce. 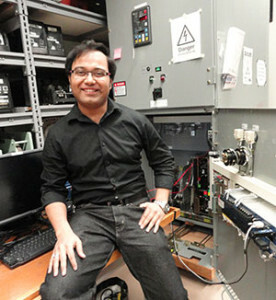 • Saugata S. Biswas, who won the top graduate student award for developing an online monitoring system for circuit breakers installed at power substations. Hundreds of thousands of circuit breakers on power lines across the U.S. connect or disconnect system assets to the electric power grid. They also automatically trip to isolate faults in the system. Circuit breakers can occasionally fail and generally do not have a self-test system to detect failures. Biswas designed and tested an automated system for monitoring circuit breakers that can alert operators and provide suggested remedial actions. The system will lessen the chances of an undetected failure and increase power grid reliability. The work was supported by Schweitzer Engineering Laboratories. • Sayonsom Chanda, who received a second place award for developing a tool for better modeling of campus microgrids. Chanda aims to develop a reliable microgrid for university or corporate campuses that would keep the lights on during severe power outages both on the campuses and in surrounding neighborhoods. The project is part of the Pullman Smart Grid Demonstration Project. Supported by the U.S. Department of Energy and headed by Avista Utilities, the regional project is designed to expand upon existing electric infrastructure and test new smart grid technology. Chanda also receives support from Microsoft and Puget Sound Energy. WSU winners were advised by Anurag K Srivastava, assistant professor of electrical engineering and director of the Smart Grid Demonstration and Research Investigation Lab within the Energy System Innovation Center at WSU.